Discover how we can make your Banff wedding even more enchanting. All Banff weddings are enchanting. But adding a sleigh ride or a horse-drawn carriage ride can turn your special day into an event that none of your guests will ever forget. 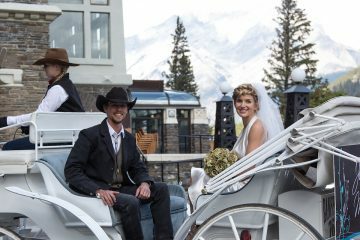 Declare your love while surrounded by the snow-speckled peaks of the Rocky Mountains and spend some romantic time together on a private winter sleigh ride, take the whole wedding party on a group sleigh ride, or arrive in style with a private carriage ride during the summer. 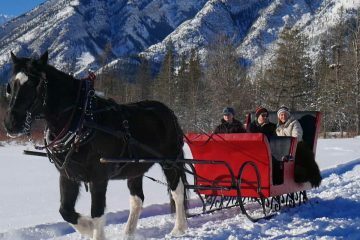 Private sleigh rides are available for just the two of you with sparkling wine, chocolates and an authentic buffalo robe to keep you warm. 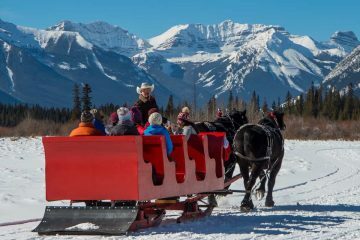 Large sleighs can seat 12 or 18 people each and we’re able to accommodate groups of up to 66. 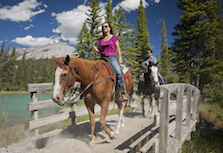 Carriage rides can fit up to six people and include pick-up, tour and drop-off to almost any location in Banff. Plenty of options for customizing your sleigh or carriage rides. Call or email us to discuss your special day in more detail.